With the ancient city of Petra flooding Instagram feeds everywhere, it’s not surprising more and more people have added it to their must-visit list. 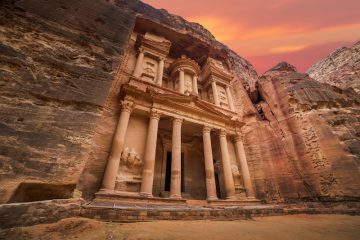 Dubbed as one of the New Seven Wonders of the World, the ancient city of Petra was made famous by the final instalment of the epic Indiana Jones movies, in which the incredible site carved into the red rock of the mountains was featured. 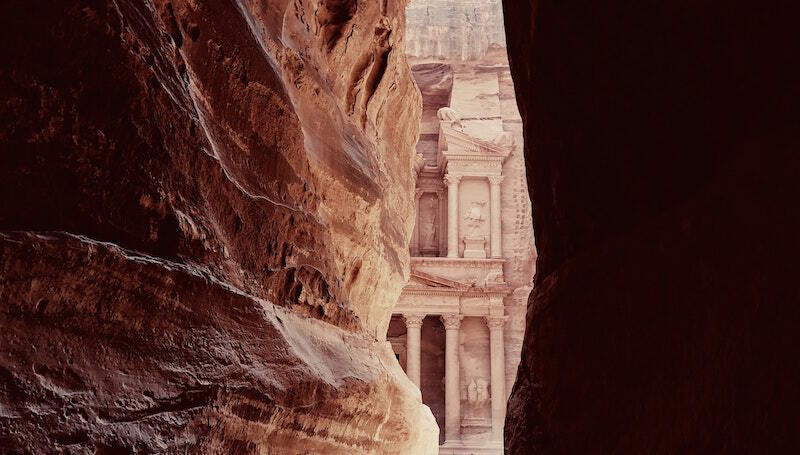 We spoke to the folks at Intrepid Travel, an international tour company with plenty of experience travelling through Jordan, to find out how best to tick Petra off your bucket list once and for all. Nothing can quite prepare you for the incredible scale of Petra. The front entrance takes you through narrow, towering canyons that make you feel like you’re starring in your own film, while the first glimpse of the Treasury feels as awe-inspiring as it must have been for Johann Ludwig Burckhardt when he first discovered the city several centuries ago. It’s easy to spend hours on end exploring this sprawling place, with buildings intricately cut into the rock in each and every direction you look. With the hustle and bustle of modern day market stalls and tourists, you can almost imagine what it must have been like all those years ago as a thriving settlement. In the higher reaches of the city you’ll find the Monastery, the city’s largest monument which is thought to date back more than 2,000 years. Stand at the foot of this incredible feat of workmanship and it’s hard not to be taken aback by its grandeur. In fact, that’s a feeling that you’re sure to experience throughout the spectacular city of Petra. Convinced? 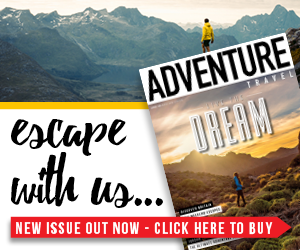 Why not enter our competition for your chance to win a trip to Jordan including flights and a bundle of Osprey gear worth over £3,000. First things first, you’ll need to figure out the logistics of getting there. For many, the most feasible flights from the UK land in Amman, the capital of Jordan and where most tour operators travelling to Petra depart from. Both British Airways and Royal Jordanian Airlines operate regular direct flights from London Heathrow to Amman on a daily basis, so you should be able to find some flights that work for you. Once in Amman you have two options. You can drive or catch a bus to Wadi Musa, the closest town to Petra and where the visitors centre is located (where you must buy your entrance tickets). It’s then a short walk to the ancient city through a rocky passage known as the Siq. If you’re looking for a more adventurous way to get to Petra, then you’re best off booking an organised tour to Petra that departs from Amman. 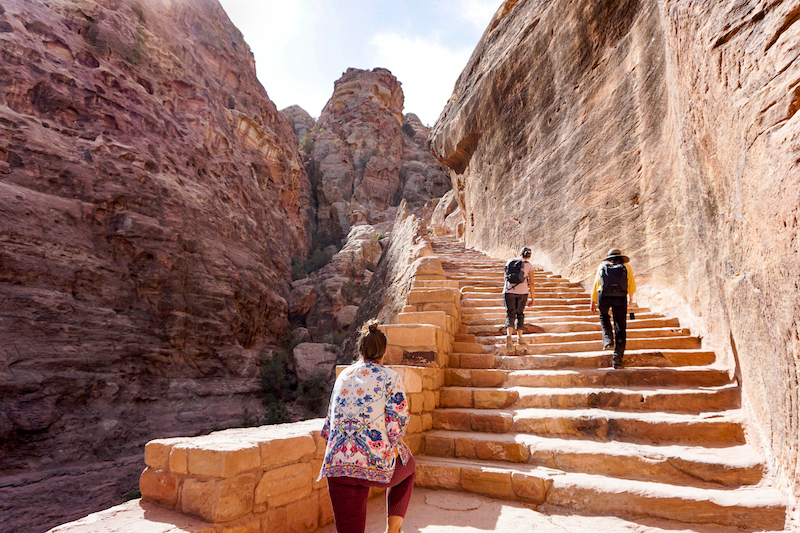 You can find lots of tours that incorporate some more challenging trekking through a back entrance to Petra, or visit other interesting sites en route to really get the best of your trip. 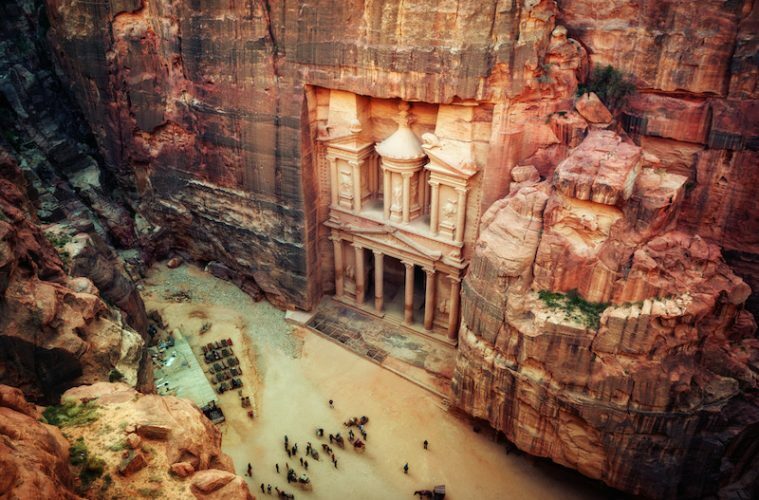 Here are a few examples of fantastic tours to Jordan. When is the best time to visit the ancient city of Petra? The ancient city of Petra is found deep within the barren desert landscapes of southern Jordan and can therefore be an overwhelmingly hot place to visit in the peak of summer. 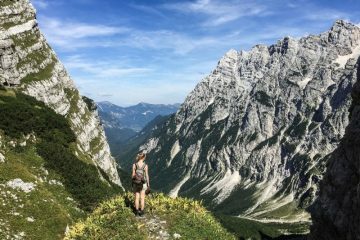 Your best bet is to visit during spring (March to May) or autumn (September to November), where daytime temperatures are a manageable 18-25C. As for the best time of day to visit Petra, the early bird really does catch the worm. If you can’t get there early, then going after 3pm is a good idea as you’ll avoid the morning rush, and you’ll get to see the whole city bathed in the warm glow of sunset, when the ruby red rocks deepen to an even more vivid shade of crimson. Again, heading to Petra with a reputable tour company means you’ll have a guide on hand to point out fascinating features you may have missed on your own, and choose the best time to go based on experience. 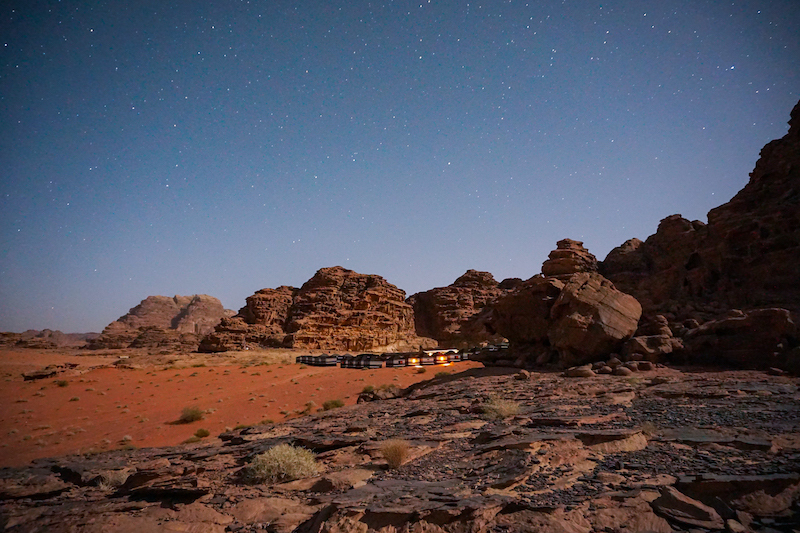 So, what else is there to do near the ancient city of Petra? So, you’ve got there, had a good old nosey around, taken plenty of photos for the ‘gram and now you’re thinking, what next? Luckily, there’s plenty more fascinating things to see and do nearby. The Wadi Rum desert is three hours away by car and is known as ‘The Valley of the Moon’ thanks to its incredible crater-ridden landscapes. The famously salty Dead Sea is a similar distance away, where you can experience the weightless feeling of floating in the deepest hypersaline lake in the world. There’s plenty of opportunity for trekking and other adventurous activities near the ancient city of Petra – this is the desert after all. If you want to combine your trip to Petra with other activities and adventures nearby then you’ll get the most value for your time and money by going on a tour. 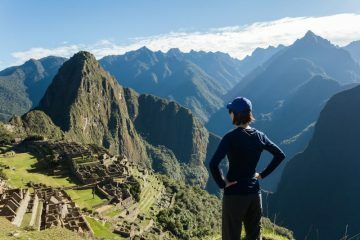 There are hundreds of different tours to choose from, all combining a different variety of activities, so you can easily find one that suits your itinerary best. 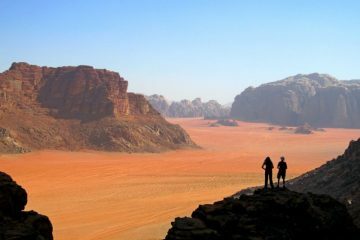 Intrepid Travel are a well-recommended worldwide tour company with dozens of trips to Jordan to choose from. 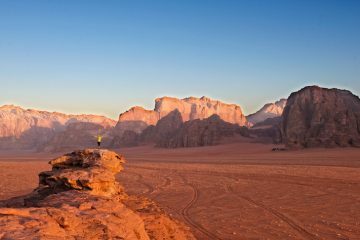 Whether you’re a foodie and want to combine your trip to Petra with sampling some of the most mouth-watering Jordanian fare, or you’re a trekking fanatic looking for a more challenging route for your pilgrimage, Intrepid has tours to suit every taste. Trips with Intrepid generally include accommodation, ground transportation, a guided tour of the ancient city of Petra, as well as a knowledgeable English-speaking guide for the entirety of your trip. 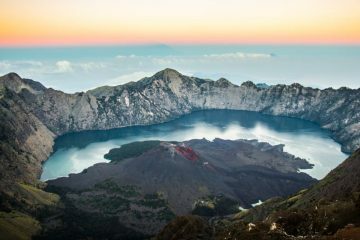 Depending on the tour, some meals and other activities and excursions may also be included. See the company’s full selection of tours here.